The ultimate guide to Pyha ski holidays in 2019 & 2020. Rubbing shoulders with the spectacular Pyhä-Luosto national park, Pyha has everything you’d expect of a classic Lappish resort: cosy log cabins, snowy pine forests and a chance to enjoy a reindeer safari or traditional sauna-ice swimming session. The skiing is good too – floodlit into the early evening with a mix of long, child-friendly cruisers and mighty moguls. Lovely Pyhä is an authentic Lappish resort on the south east corner of the beautiful Pyhä–Luosto National Park. Famous for its dense pine forests, frozen lakes and waterfalls, as well as being a top spot to see the northern lights, the area is sacred to the Lappish people - ’Pyhä’ (pronounced ‘poo-ha’) translates to ‘holy hill’. 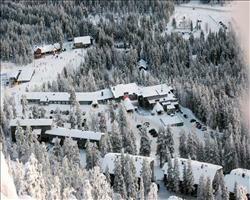 Lousto is another small ski resort located to the north of the park. The two ski areas aren’t connected but Lousto is worth visiting for its famous Amethyst mine. 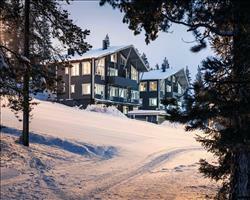 This winter spot is compact and uncommercialised, with uncrowded slopes and cosy log cabins. It feels like a world away from home, but isn’t too hard to get to; the nearest train stations are Rovaniemi and Kemijarvi and both have direct bus connections to the resort, as does Rovaniemi airport. The whole place has a magical, festive feel, and is perfect if you don’t want to focus on the skiing 24/7 as there are so many other things to get stuck into. A trip here is a proper Lapland experience, where you travel north of the Arctic Circle to find the Sami culture still embedded with reindeer farming and Santa myths. Husky rides, reindeer safaris, ice swimming and snowmobiling are just the tip of the iceberg when it comes to must-do activities here. Since being taken over by the brains behind nearby ski resort Ruka, this has become a popular place for its small but sweet ski area on top of everything else. Thanks to massive investments, floodlit pistes and fast chairlifts are a given nowadays and you can access the top of the fell from the village via the PyhäExpress in a speedy 4 minutes. Your ski pass also includes Ruka which has a further 34 slopes to sink your teeth into. Good things really do come in small packages- Pyhä won the Finnish Ski Resort of the Year 2011 at the World Ski Awards and is appearing more and more on peoples lists of ‘places to visit’. View our detailed Pyha snow forecast or snow report and see all live webcams, piste maps, road and travel maps and lift pass prices. For a picture of historic snow conditions see the snow depths month by month with our Pyha snow history. The area is ideal for beginners, with confidence-boosting blues and a handful of special, kid-friendly ‘Rosa & Rudolph’ blue run adventure routes. The family slopes just above the centre of the village is the spot to start; the ‘2 Blue’ is a great long and easy blue to get to grips with. The Kids’ Ski Area is ideal for tiny tot fun-learning in a safe and secure environment with lots of snow fun and the adjacent Junior SnowPark gives older kids hours of fun. Although less well known for its intermediate skiing, the Northern Slopes include some long tree-lined reds that intermediate skiers will love bombing down. There’s significant variation between them and several offer spectacular views of the National Park, especially the more challenging ‘Polar’ which is an FIS-classified slope. Advanced skiers and boarders will relish the challenges that the best advanced ski terrain in Finland provides; master Huttu-Ukko is the country’s steepest slope and is often used in World Cup mogul competitions. Off-piste lovers are in for a treat if they hit the Chairlift Slopes on the edge of the National Park and then explore its adjacent off-piste. Pyhä is constantly chosen as the base for the Finnish Freestyle Skiing team’s training and there’s a good snow park extending to a length of 600m. It’s completely floodlit for late-night tricksters with a big box, a camel hump line and a table top as well as a selection of rails. The floodlit nature of most of the pistes ensure skiing even in low-light conditions and its tough terrain means that that it’s more exciting than small resorts of the same size. There is extensive cross-country skiing, roughly 150km, 25km of which is floodlit. Some is even located within the beautiful national park, so it’s pretty unbeatable. Pyhä’s nightlife is friendly and fun – there are a handful of bars but no clubs or discos (Ruka might be your answer if you want the best of Finnish après). Ski Bistro often has live music or you can try out the unusual Ice Bar which is always busy but it’s the Carlsberg House on the Polar slope that’s the official hotspot for après ski. It’s the place to go after the slopes with their priority being to keep everyone hydrated and on good form with cheap drinks deals and loud music till the early hours. For a more relaxed vibe, Sportbar is a chilled pub space with sports screens, pool and even karaoke now and again, if you fancy yourself as the next Beyoncé. As well as the usual international favourites, there are lots of interesting delicacies including sautéed reindeer, wood grouse and fresh fish from the lakes – you might even come across a Finnish cloudberry if you’re lucky. Restaurant Tsokka is famous for its winning waffles and if you have a sweet tooth, Kopara does an incredible blueberry pie.. For some good old Alpine comfort food, Racca does a good fondue and raclette and Ski Bistro’s pizzas might hit the spot. Serving up the best of Lappish delicacies, Glacier a la Carte is so popular it’s worth booking a table for and you can sample sautéed reindeer at Huttu-Uula, when in Lapland…! Lapland’s huge selling point is that it’s Santa’s home and children will love the excursion trips to Santa’s secret getaway. This is also a super place to see the Northern lights first-hand. Must-try pastimes include husky sledging, reindeer safaris and over 400km of snowmobiling trails, some of which wind through the National Park. If you don’t fancy the slopes or want a different flavour of adrenaline, there’s also Icelandic horse-riding, ice-fishing, ice-karting and ice-climbing to try. Yet another activity to add to the endless list on offer is the option to visit the Amethyst Mine where you can even dig for your own gems. When is the best time to ski Pyha? Finland is famous for its late season skiing and with most of the slopes here being north-facing, the slopes tend to be snow-sure all season long, with lots of good powder cover for off-pisters. The slopes are hardly ever crowded or overrun so visiting here instead of the bigger resorts in the Alps can be much more enjoyable, thanks to the PyhäExpress, queueing just isn’t in Pyhä’s vocab…As well as investment in lift systems, the resort now has 12 snow canons and even though there isn’t much sunlight here during the winter months, the floodlighting means slopes stay open till 5pm. It’s really important to wrap up warm here as temperatures are much lower than you get in the Alps - invest or hire some high-tech thermals and ski gear so you can comfortably enjoy the area. Pyhä is arguably one of the most family-friendly resorts you’ll come across; put your priorities of good snow and ski-school, heaps of non-ski activities and a child-safe resort in one place and you’ve got Pyhä! The Snow Play Area is kitted out with a magic carpet and rope tow - perfect for kids to learn on - and is next to some very easy blues. If the kids are a little older they’ll love the Junior SnowParc with its mini jumps, boxes and rails; children can spend entire afternoons here and not want to leave! As much as kids love skiing they sometimes want to try something else. You’re not short of choice here, with several places offering swimming, horse-riding, ice-climbing and ice-karting to name a few. Restaurants like Huttu-Uula have play areas for children for when mum and dad fancy putting their feet up with a cuppa. The real draw of holidays here is the chance to give the clan the winter wonderland experience of a lifetime. Memories of husky adventures, reindeer safaris and snowmobiling races will last forever, on top of the prospect of meeting Santa Claus himself which is absolutely magical. Before you set off, make sure you stock up on lots of good thermal layers as the average temperatures are a lot lower than you get in France or Austria – sometimes snowsuits are available to hire so you don’t have to fork out on them. Filling pockets with snacks and making regular hot chocolate stops are a good way to keep everyone warm and happy. 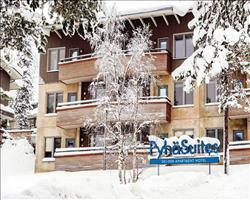 Although it’s not a big resort with an extensive ski area, Pyhä fits the phrase ‘good things come in small packages’ perfectly as what it does offer is snow-sure, uncrowded slopes that cater for various levels- ideal for groups of different abilities. The resort is fantastic for beginners and children as it has a Kid’s Ski Area and the Family Slopes offer a handful of straightforward beginner blues, whilst the superb off-piste will keep experts entertained for days. For those that sit in the middle of the group in terms of ability, there are several nice long reds that you won’t get bored of because the snow tends to be perfect throughout the season. This is a perfect option if your group includes non-skiers - with so much to do here, even the keenest skier will want to take some time off the slopes. Not only do you have the unique opportunity of husky and reindeer safaris or Icelandic horse-riding but for a small resort, if you’re up for an afternoon of adventure, give ice-karting, ice-climbing or even ice-fishing a go. For a less sports-intensive vibe, a walk in the national park or a visit to the Amethyst Mine might be right up your street. Pyhä isn’t known for its pumping nightlife, but it does have a handful of great bars with fun live music and cheap drinks to enjoy with friends; the lively Carlsberg House and the Ice Bar are two of our favourites. The atmosphere amplifies a hundred percent over the festive period when Lapland is in its element, and the town usually buzzes with Christmas decorations, kids on sledges and continuous live music streaming out from the bars.